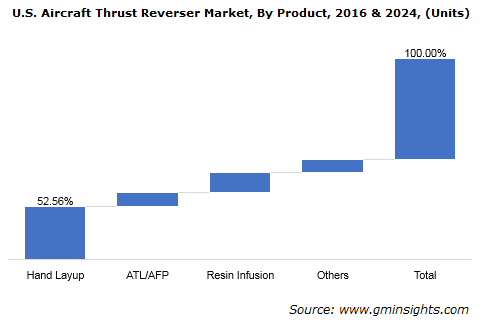 Hydraulic « Global Market Insights, Inc.
As the frequency of air travel has been increasing in the recent years, aircraft thrust reverser market has gained robust traction in the transportation space. That to say, despite rising fares and climbing fuel costs, air travel has now become a conceivable mode of transportation. Not to mention, with rising disposable incomes and changing consumer lifestyles, an increasing percentage of people choose to spend vacations at exotic locations, further stimulating the aviation industry trends. In consequence, this has had a commendable impact on the commercialization scale of aircraft thrust reverser market, as these products are critically important components in an aircraft for ensuring efficient deceleration and landing. Since technology plays a major role in improving the design and manufacturing style of these components, aircraft manufacturers have been collaborating with leading players of aircraft thrust reverser industry in order to manufacture highly efficient and advanced reversers. In a recent instance, one of the leading aircraft thrust reverser market firms, Spirit AeroSystems celebrated its delivery of 10,000 fuselage, which includes thrust reversers, to Boeing 737. The last couple of decades have witnessed a major evolution in aircraft designs. Modern aircrafts are noted to encompass greater takeoff gross weight and require more runway length for takeoff and landing. 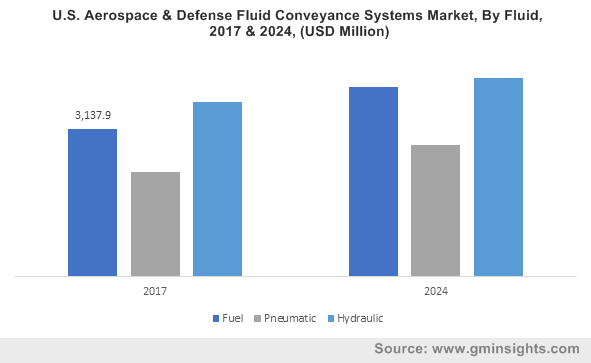 To cope with ever increasing airport flow and emergency situations, an increase in demand for reliable deceleration systems has been observed, propelling aircraft thrust reverser market growth. It is also prudent to mention that thrust reverser designs significantly influence engine nacelle weight and wing performance. As these parameters decide the overall operation efficiency and maintenance cost of the overall aircraft, efficient reverser designs contribute a great deal toward aircraft thrust reverser market. The material used for the construction of thrust reversers is as important as the design and working mechanism. Research suggests that the weight of thrust reversers account for 30% of the whole nacelle weight. Air leakage and pressure loss caused by thrust reversers can also lead to 1% increase in the flight’s fuel consumption. The chief advantage of using thrust reversers for speed deceleration is that they are not affected by wet weather or icy runways. They can act to enhance aircraft safety in a wide range of conditions. Therefore, efforts are being made by industry players to design and manufacture thrust reversers with lighter materials – especially composites. Another vital factor that may influence this business sphere is airports attempting to restrict noise levels. As manufacturers innovate methods to improve acoustic protection during takeoff and landing by reinforcing the structure and using novel materials, aircraft thrust reverser industry is likely to witness considerable expansion. 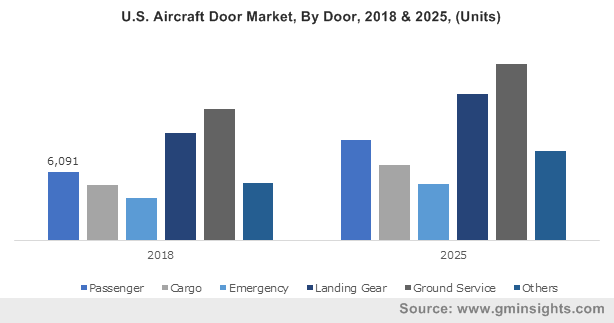 Subject to the fact that the region houses numerous industry biggies, North America is projected to account for a prominent share of the overall aircraft thrust reverser market. The presence of a large passenger base and a developed airlines industry has also contributed to the growth of aircraft thrust reverser industry in the region. Europe aircraft thrust reverser market on the other hand, will be driven by countries like Germany, France, Italy, and Russia, where stringent government regulations have been laid across to produce more fuel-efficient aircrafts. With globally acclaimed regulatory bodies emphasizing on the importance of aviation safety, aircraft thrust reverser industry stands to witness a rising growth potential over 2017-2024. Speaking of safety in fact, it has been observed that runway excursions are one of the most common type of aviation accidents. According to the US National Business Aviation Association, nearly one third of all business aviation accidents are caused by aircrafts overrunning the runway or veering off during takeoff or landing. Efficient thrust reversers can go a long way in mitigating such accidents. Indeed, the rising demand for these products to minimize the occurrence of such mishaps is likely to propel aircraft thrust reverser market size to quite an extent. As per estimates, aircraft thrust reverser industry size is forecast to cross $2.2 billion by 2024. This entry was posted in Automotive & Transportation and tagged AFP, Aircraft Thrust Reverser Market, Aircraft Thrust Reverser Market Research, Aircraft Thrust Reverser Market Share, Aircraft Thrust Reverser Market Size, ATL, Bucket, Cascade, Electric, Hand Layup, Hydraulic, Large Widebody, Medium Widebody, Pivot Door, Regional Jets, Resin Infusion, Single Aisle, Small Widebody. Hydraulic Fracturing Market has progressively evolved in the recent years as the production rate of conventional hydrocarbon is on a decline. Increasing reliance on crude oil, natural gas and other renewable energy sources, to meet up the growing energy demand is spurring the industry growth. A noticeable surge in world crude oil demand from 95.58 mb/d to 96.95 mb/d within a year span is expected to positively influence the overall market. As per a report by Global Market Insights Inc., “Hydraulic Fracturing Market is poised to record a revenue of USD 68 billion by 2024 at a CAGR of 12% over the period of 2016-2024.” With the increasing demand for hydrocarbons, hydraulic fracturing will continue to be an essential process to feed the energy requirements. Favorable government initiatives taken by China and U.S., such as tax incentives, easy FDI provision in hydrocarbon sector as well as financial backing is catalyzing the market growth in these regions. However, hydraulic fracturing industry is not observing a global approval as environmental threat associated with it has made many countries ban this super fracking process. Governments worldwide are working together to asses and manage these environmental issues, which will prove to be beneficial for the overall market. Horizontal hydraulic fracturing process which is quite popular in extracting oil and gas from nonrenewable energy reserves is expected to show an upward curve owing to its better productivity than vertical drilled. Horizontal hydraulic fracturing market is projected to grow at a CAGR of 13% over the forecast time frame. 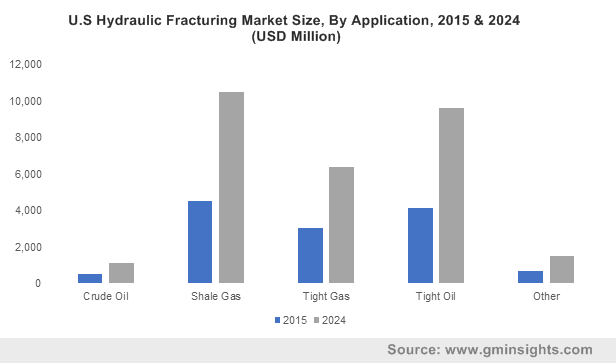 Technically, Plug and perforation based hydraulic fracturing industry dominated the global industry in 2015 with a volume coverage of 70% of the total market and will generate considerable revenue in times ahead. The lucrative growth prospect of this technology can be credited to its wide spread application in drilling horizontal wells. Sliding sleeves which is another promising technology affluent in the market, will also record moderate growth path. The cost effectivity and time efficiency are the two major factors driving the sliding sleeves based hydraulic fracturing market. Hydraulic fracturing techniques are mainly associated with variety of applications related to oil extraction from non-renewable energy sources such as shale gas, tight oil, tight gas, and crude oil. Global hydraulic fracturing industry from shale gas application is expected to hit a revenue of more than USD 15 billion by 2024. U.S adequacy of unconventional resources especially shale basins is expected to spur the overall industry over the coming seven years. For instance, U.S. shale oil extraction in 2015, almost exceeded half of the total crude oil production of the region. Strict government regulation to curb carbon emission will fuel the U.S hydraulic fracturing industry from natural gas applications. Both North and South America hydraulic fracturing market is expected to witness a tremendous growth prospect in future based on these two countries past years’ revenue contribution. South America driven by Argentina industry held a record of USD 2 billion in 2015 and is anticipated to witness a profitable market in future. Canada will be the main revenue contributor for North America’s industry share. Another prominent region partaking actively in the global market is Asia Pacific. China hydraulic fracturing industry alone accounted for more than 45% of the regional revenue in 2015, and is projected to prominently drive the regional market in future even. The growth projection can be credited to China’s unconventional energy resource abundance. A recent estimation shows that China consumes almost 1,115 trillion cubic feet of natural gas, which is around twice of U.S. Indonesia and Iran hydraulic fracturing market will also grow substantially over the coming seven years. Indonesia industry will generate a revenue of more than USD 300 million by 2024. Key players in the industry include FTS, Calfrac Well Services, Weatherford International, and Superior Energy Services. Rigorous research to exploit more of untapped potential especially tight gas and shale will push the overall hydraulic fracturing market. This entry was posted in ENERGY, MINING, OIL AND GAS and tagged Energey market, Fracturing, Hydraulic, Hydraulic Fracturing, Hydraulic Fracturing Market, Hydraulic Fracturing Market Analysis, Hydraulic Fracturing Market Outlook, Hydraulic Fracturing Market PDF, Hydraulic Fracturing Market Report, Hydraulic Fracturing Market Share, Hydraulic Fracturing Market Size, Hydraulic Fracturing Market Trends, Hydraulic Fracturing Process.